All of the above photos taken by Peter Nilsson! Weather forecast for Wednesday looks promising, so the show is still on. Doors open at 20.30, screening starts at approx. 21.00. There’ll be hotdogs and hot drinks, but might still get chilly so bring a sweater and a blanket. Travel directions are found on the blog, under ‘About us’. From a trial run last night (on screen is the first film ever shown in a cinema, 46 seconds of ‘Workers leaving the Lumière factory’ by the brothers Lumière). Light conditions acceptable from around 21.00. 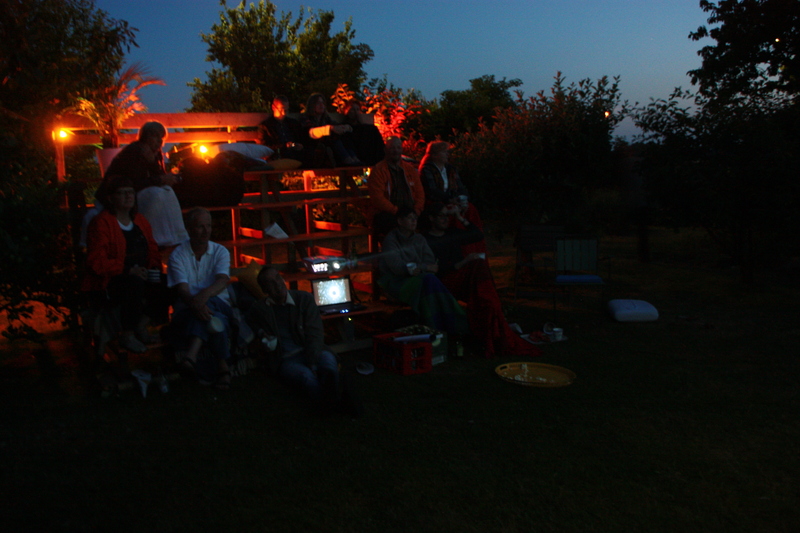 Sunshine Socialist Cinema is an outdoor cinema powered by solarpanels, run by artists Kalle Brolin and Kristina Müntzing. 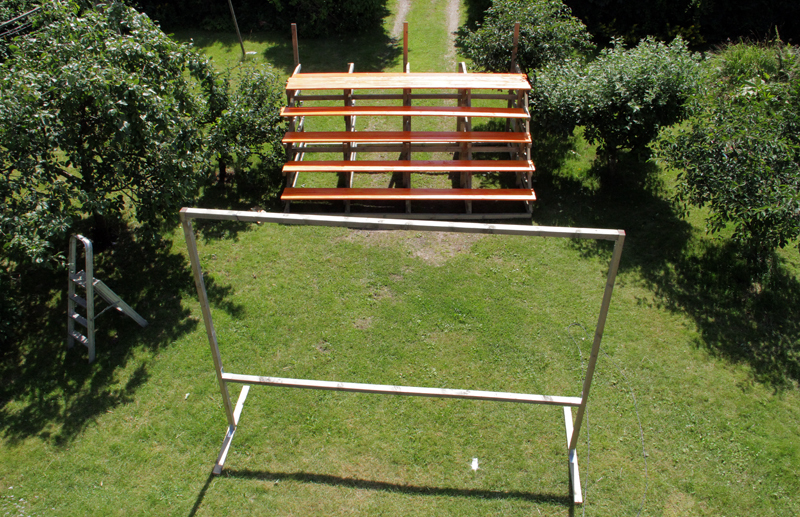 We’re re-distributing surplus light from day to night by solarpanel and projector, and screen films that generate discussion on socialist topics. 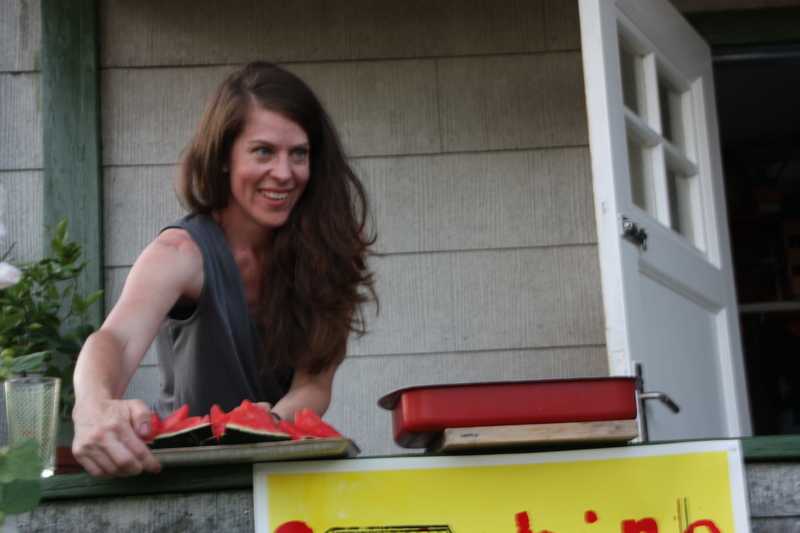 Some themes for the films and videos to be screened include redistribution of surplus and contemporary commons, post-industrial survival strategies, and artists committing to a collective. 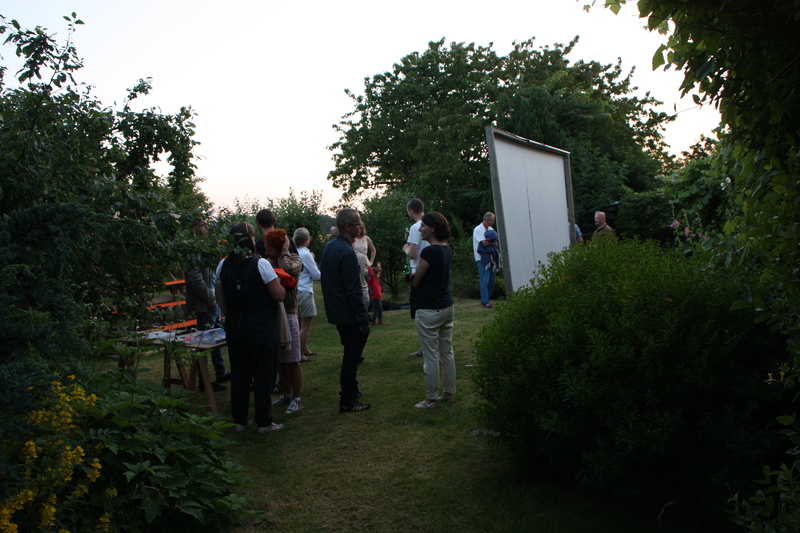 The cinema is installed in a garden in the southern Swedish countryside, with screenings occurring regularly during the summer months. 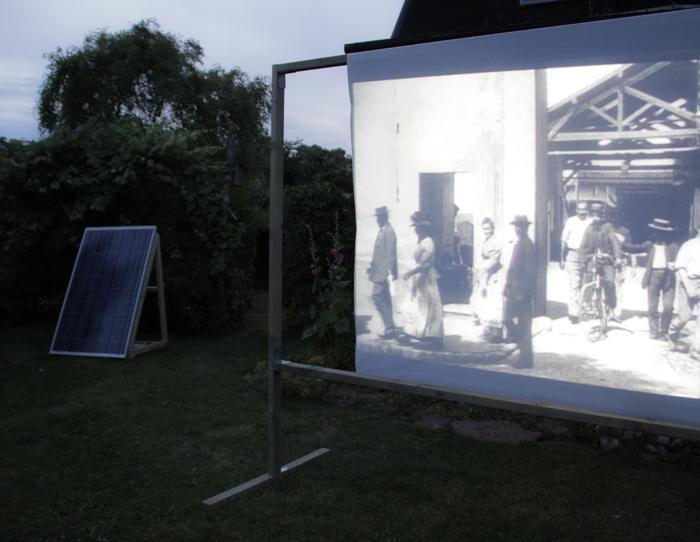 A 230 W solarpanel provides power for a 270 W projector, meaning two hours of sunlight gives us one and a half hour of projected film at night. Screen and bleachers purposebuilt, free entrance, artworks on display, and connections developed gradually with local organizations. Programming is discussed and technical issues worked out in a study group run within the local workers educational association, ABF, where we’re also figuring out a typology of political film and filmmaking. 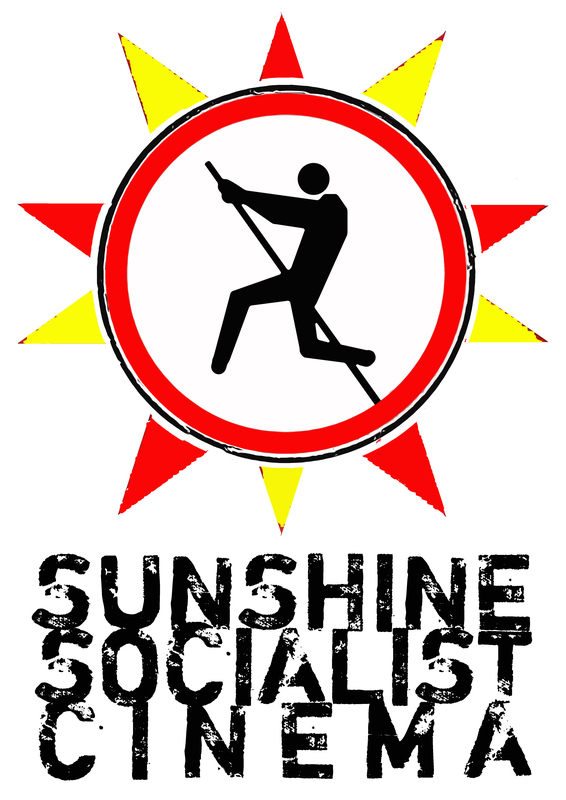 The Sunshine Socialist Cinema is inspired by public screenings attended in Parque Rivadavia in Buenos Aires in the noughties. 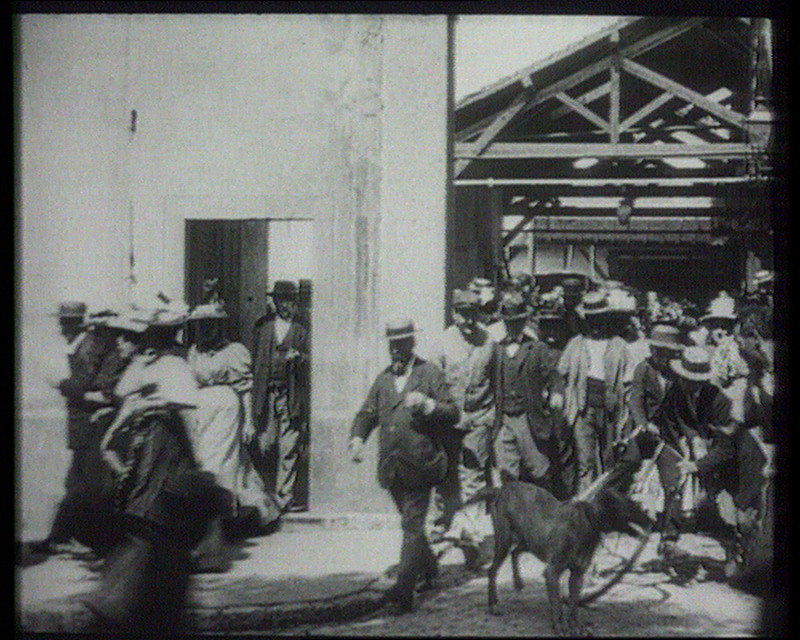 Workers Leaving the Factory by Harun Farocki starts from the first film ever shown in a cinema, and traces the recurring image of workers exiting a factory throughout filmhistory, setting the stage for the post-industrial condition. What is the image of the worker, when the worker has left the factory, and labor is performed in every aspect of life? Is the dissolution of the workforce outside the factory gates where films pick up on individual characters and follow them away from collective life? In Politicamente Correcto!, Claudia Del Fierro dresses up like the workers at a textile factory in Santiago, Chile, and joins them whenever they exit the building for a cigarettebreak. An artist blending in visually with the workers, entering and exiting the gate unnoticed, she creates an ambiguous picture of both alienation and of the artists’ desire to place herself on the side of the workers. We end with Space Debris by Lina Persson, a film showing the perspective of a camera detached by accident from an astronaut, who is in the process of trying to free a stuck solar array on the international space station. The camera drifts into space and continues transmitting film as it moves further and further out of range. 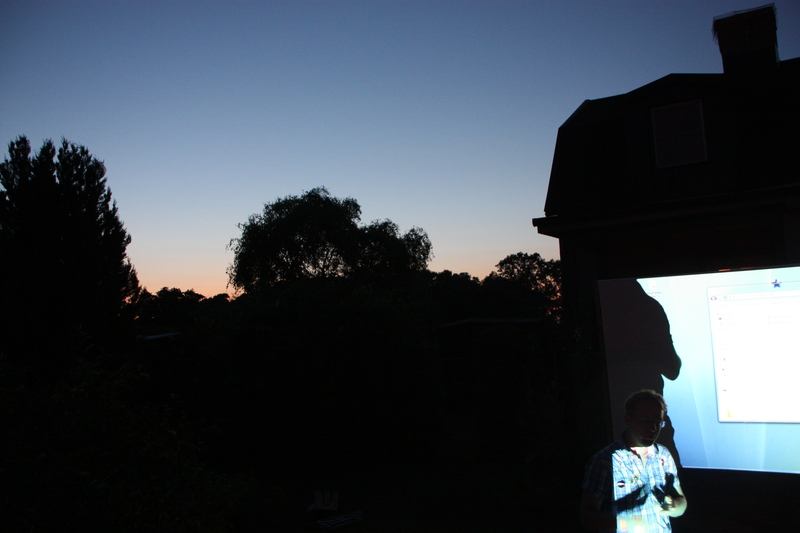 Sun going down; upcoming screening! 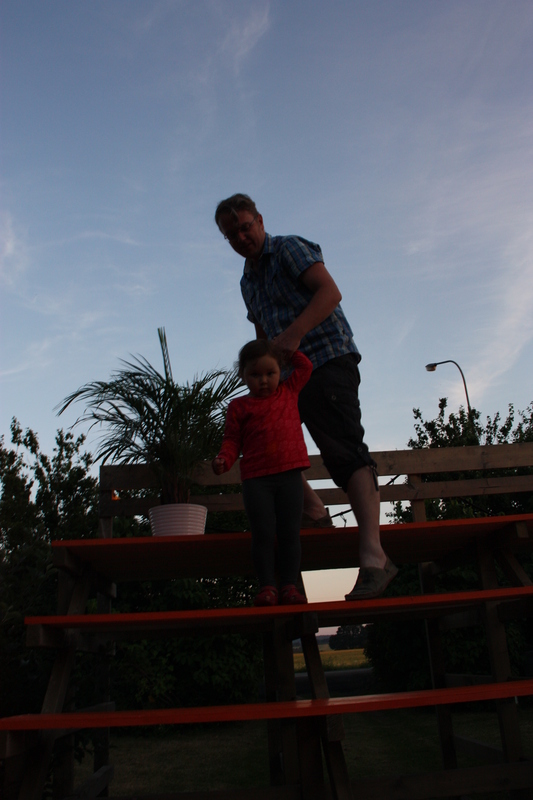 On Wednesday, July 25:th 2012, the sun sets at 21.31 in our part of the world. The weather forecast says it’ll be clear skies. Preliminary program: we’ll be screening from around 20.30!